So, given the chance, would you buy the resurrected Samsung Galaxy Note FE? So much noise for a phone that was considered dead, wouldn't you say? Yeah, we are talking about the Galaxy Note 7. A handset that tripped on launch not once but twice and Samsung pulled the plug on the entire thing before any more embarrassing situations occurred. However, in recent months, we've been hearing that the Note 7 is getting its 3rd stab at being a phone that actually exists. Now called the Note FE (fan edition), it comes with a slightly smaller battery, but every bit as much swag as before. Now, we've asked you this before, when not much was known about the device, and all we could do was speculate, especially when it comes to price. But recent events have caused the question to pop into our heads again. Namely — the Note FE has been doing amazingly well in Korea. The handset sells for about $608 over there, which is a bit more than we expected Sammy would go for, but apparently, it's good enough. Some industry insiders are claiming that Sammy has a stash of FE units earmarked for International markets. Yes! I need it now! lol no thanks. Too laggy, small battery, and overpriced. ^ I'm a tad drunk right now, but even I can see where this comment is going...! Don't get outraged, fellows... That guy is feelin' alone and just need some TLC... G'Day! Because 3500mah isnt enough? It's bigger than the iPhone battery...lasts lo her too and charges faster too. Every phone will never be perfect. What phones you and Dumberg have? Your Bahrain is laggy, to small and its not worth any price. Probably why they claimed to only make 400,000 units. Especially without that infinity display??? 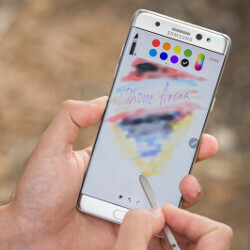 Maybe they needed the note 7 to die to hype up the note 8 infinity display. How laggy is your brain? I think the latest iPhone is IP67. You would be correct. I still don't plan to test it out tho, but its nice to have incase you spill something on it or in the rain. These phones are too expensive, I'm not gonna risk ruining it by taking it in the pool or dropping it in a bowl full of water just to see if it is sealed properly. I still keep my 7 Plus in a life proof case tho, mainly for drop protection and cause its thinner than otter boxes. I'm OCD about my phones, I like them in pristine condition. Rational individuals would pick option #2 or #3 in most instances, but a lot of people around here aren't rational. So you're the guy who said 11>12.1?? A) I never said that B) That has WHAT to do with this article? I thought a rational person would do some sort of fact check before spewing garbage. No? Look up the term rational, son. Besides, I don't know why you're bragging about a conglomerate making more money than a consumer electronics one. I am not here to brag about anything. But do you know that those are not the most delusional s**t like you said? Rationalize wanting to pay $600 bucks for a year old phone with the prior history of this one for me, fam? Better yet, rationalize buying this literally two months before the next model is released. Easy. The iPhone 7+ 128GB right now is 869. It will be 769 when the next iOhone drop. So foe $600 the Note 7 still does more than the present iPhone and has more useful features. Also considering the phone was $850 st release, $600 IS cheaper than any other flagship im its class. Last I checked no pbone matches the Note. It's not about being rational. People buy year old phones for reduced prices foe new models. The fact yourw trying to make am exception of this o e, show yoir total lack of even remote God given common sense. I'm fact you probably don't believe in good like mostvrational humans do. So you won't have any common sense to begin with. It must be nice to be stupid. "Rationalize wanting to pay $600 bucks for a year old phone with the prior history of this one for me, fam" Unless you've been living under a rock, you'll realize Samsung has already addressed the issue instead of irresponsibly blaming the user for their flawed design. With that fixed, the device is still far more capable than any Smartphone currently on the market. So, if you have some way to rationalize paying $700+ for the just as old iPhone 7/7+ at this time, also 2 months before the next iPhone, this will only be easier to rationalize, unless your double standards get in the way. You dont get to decide what anyone personal choice is rational or bot. It's a year old phone. How many people buy year old phones? Lots of people. Being an idiot must be a awesome feeling. Because you won't stop. We're you born that way? Or did you take acting classes?! Ah, so you're the Arbiter on what's rational. I wondered who got that job. Hey, someone had to take it, am I right? It was either Arbiter on what's rational, or Arbiter on which version of "God" is the acceptable dictation. I think we can both agree the guy with the latter title is in for an epic s**tshow, so I chose the former. Yeah me!!! You're not doing a very good job. Trump is president. I royally f**ked that up... my condolence to the American people. But you love lead paint chips. Note FE, eh? Only if it was below 500 Aussie Buck. Aye, Aussie, not Yankee ones... And that translates to 400 something USD... No one likes to play around with a grenade, even if its defused, eh? G'Day!